In this article we will examine the studio discography of the greatest band in popular music. The Beatles did it all first, invented recording techniques, developed the role of band members in a rock music setting and wrote the greatest songs of the 20th century. The ESSM teachers have also selected highlights for your instrument with songs recommended to learn to improve your playing. It should be noted that members of the band often played other instruments in the studio. From the first notes of “I Saw Her Standing There” to the last screams of “Twist and Shout” the energy lifts out of your speakers. Essentially recorded in one day on February 11, 1963 the album is a mix of Lennon/McCartney written songs and covers. George Harrison and John Lennon’s Gibson J160 acoustic guitars are heard frequently on the recordings. Guitarists learn “Please Please Me”, great octave hook played by George and that lick before the chorus. Drummers listen to the snare work on “Boys”. Bass players learn “I Saw Her Standing There” get those fingers walking. Following up the debut album with another consistent release of original rockers, covers and ballads. After conquering their homeland with “Please Please Me”, Beatlemania reached the USA around the time of this release with the success of the single “I Wanna Hold Your Hand” and an appearance on the Ed Sullivan television show. Of note, singles were not placed on albums in the UK versions of the albums. Guitarists learn the guitar solo in “Til There Was You”. Drummers learn “All I’ve Gotta Do”. Bass players learn “All My Loving”. 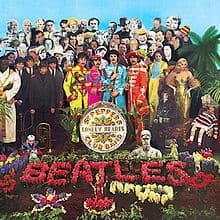 The first Beatles album to contain all original music. 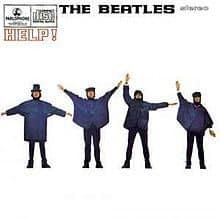 This album features songs heard in the A Hard Days Night movie as well as extra studio tracks. The best of the early albums and a classic example of the British Invasion beat sound. Guitarists learn “Can’t Buy Me Love” solo. Bass players learn “Tell Me Why”. Drummers look at the cross stick groove on “If I Fell”. Check out this clip describing how to create the classic opening chord of the song “A Hard Days Night”. Folk and country music styles influence this album greatly with more acoustic guitars and introspective lyrics featuring. Released at the end of 1964 the year that saw the band become a global juggernaut. Guitarists learn the intro to “Eight Days a Week”. Bass players learn “I’m a Loser”. Drummers learn “What You’re Doin”. Vocalists listen to the harmonies of “Baby’s in Black”. Bass players learn “Another Girl”. Drummers learn “Ticket to Ride”. The moment The Beatles matured. Leaving behind the need to use cover songs from their live act prior to becoming recording artists, all songs on the album were written by the band. Bass players learn “Drive My Car”. Drummers learn “Think for Yourself”. The Beatles begin to make heavier use of multitracking in the studio as recording technology improves. Paul also switches to using the Rickenbacker bass on studio recordings from this point onwards. Guitarists learn “And Your Bird Can Sing”. Drummers learn “Tomorrow Never Knows”. The masterpiece. No longer a touring band after announcing the had quit live performance with their final concert taking place at Candlestick Park, San Francisco in 1966. The band poured all their energy into studio creation, producing an album that shook the whole music industry. Instrumentation became far more elaborate without the need to play these songs live. Guitarists learn “Sgt. Peppers Lonely Hearts Club Band”. Bass players learn “With A Little Help From My Friends”. Drummers learn “Being for the Benefit of Mr. Kite”. This release joined songs released as singles through 1967 and from the Magical Mystery Tour television special. As bad as the special is to watch, the music is incredible. Bass players learn “Penny Lane”. Known famously as The White Album due to its plain white cover. This was a double album containing an eclectic mix of styles from rock (Back in the USSR), acoustic (I Will), heavy metal (Helter Skelter) and avant garde electronic composition (Revolution 9). Guitarists learn “Blackbird” and “While My Guitar Gently Weeps” guitar solo. Bass players learn “Dear Prudence”. Produced with very little involvement with the band themselves, this is the soundtrack to the animated movie. Containing some classic new songs, previously released songs and a side of film music composed by “the fifth Beatle” producer George Martin. See the movie it is a classic for all ages! Bass players learn “Only a Northern Song”. Drummers learn “All You Need is Love”. The album that almost didn’t happen. With relations in the band strained from recordings sessions in early 1969 in an attempt to Get Back to basics, the Beatles began to break up. Not wanting their legacy to fade with a whimper they produced this amazing swan song. Innovations of using synthesizers and including large medley of songs highlight the recording. Guitarists learn “Here Comes the Sun”. Recorded before Abbey Road but released after the breakup of the band. The project began as an attempt to get back the act playing as a band again and recording without overdubs. What eventually was released was an edited and orchestrated version of the recordings produced by Phil Spector to salvage the mess of half finished songs and lack lustre performances. 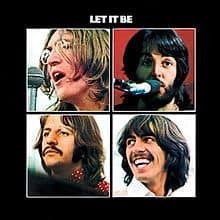 The Beatles released their own version known as “Let It Be….Naked” faithful to their intentions in 2003. Guitarists learn “I’ve Got a Feeling”. This collects all songs released as singles from 1963-1970 not appearing on album releases. Therefore we have most of the biggest Beatles hits ever appearing on this compilation. Guitarists learn “I Feel Fine” and “Day Tripper”. Piano players learn “Lady Madonna”.